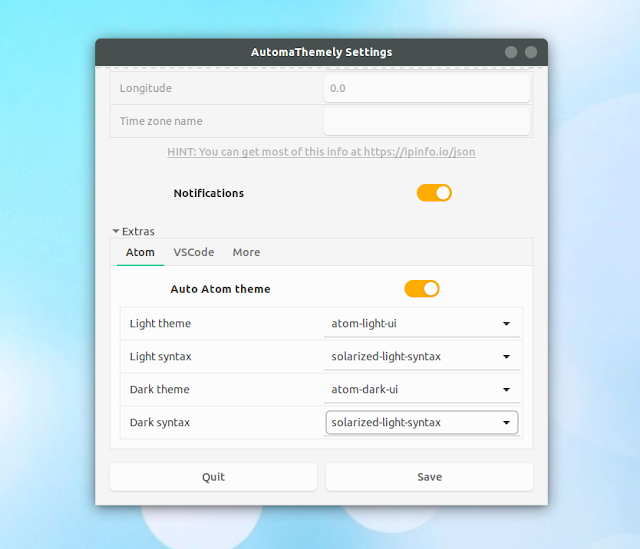 If you're looking for an easy way of automatically changing your desktop theme based on sunrise and sunset times, give AutomaThemely a try. AutomaThemely is a Python application that automatically changes Gnome themes according to light and dark hours, useful if you want to use a dark Gtk theme at night and a light Gtk theme during the day. Besides automatically changing the Gtk3 theme, AutomaThemely can also automatically switch between dark and light themes for Atom editor and VSCode, as well as between light and dark syntax highlighting for Atom editor. This is obviously also done based the time of day. The application uses your IP address to determine your location in order to retrieve the sunrise and sunset times, and requires a working Internet connection for this. However, you can disable automatic location from the application user interface, and enter your location manually. From the AutomaThemely user interface you can also enter a time offset (in minutes) for the sunrise and sunset times, and enable or disable notifications on theme changes. Update: The application initially only supported changing Gtk themes on Gnome (or Unity), but with the new 1.3 release, it adds support for KDE Plasma, Xfce and Cinnamon, as well as changing the Gnome Shell and icon theme. The latest AutomaThemely also includes a revamped settings manager, and support for custom scripts that can be triggered on sunrise and sunset. Ubuntu 18.04: using the link above, download the Python 3.6 DEB which includes dependencies (python3.6-automathemely_1.2_all.deb). The AutomaThemely download page also includes RPM packages for Python 3.5 or 3.6, with and without dependencies. Install the package appropriate for your Python version. If you download the package that includes dependencies and they are not available on your system, grab the "no_deps" package and install the Python3 dependencies using PIP3, as explained above. To set AutomaThemely to change your theme according to light and dark hours, set the desired light and dark themes, then right click the application icon and select "Update sun times", followed by another right click, this time selecting "Restart the sqcheduler".